Liturgical compiler; lived at Troyes in the thirteenth century, succeeding his father, Joseph Ḥazzan ben Judah, as ḥazzan. The Jewish liturgy is indebted to him for collecting the order of prayers which was used in the community of Troyes and which is often quoted under the title "Siddur Troyes" (Neubauer, "Cat. Bodl. Hebr. MSS." No. 1118; De Rossi, Parma, MS. No. 403). 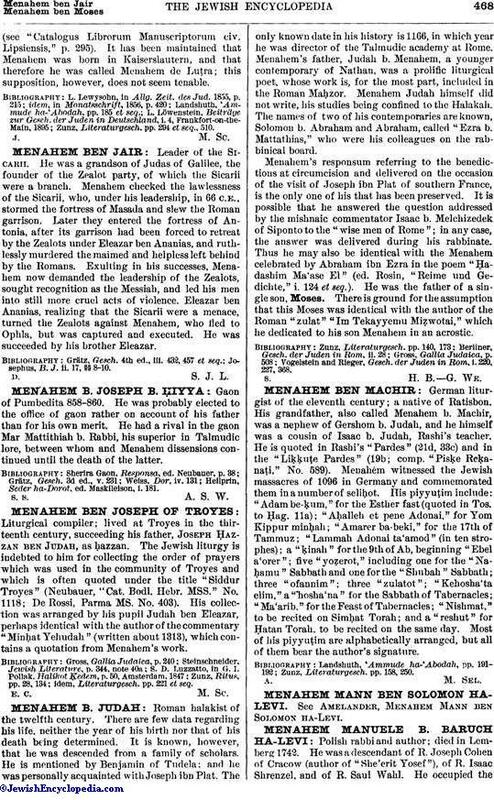 His collection was arranged by his pupil Judah ben Eleazar, perhaps identical with the author of the commentary "Minḥat Yehudah" (written about 1313), which contains a quotation from Menahem's work. idem, Literaturgesch. pp. 221 et seq.